Here are some important tips for choosing student usernames, student blog URLs and blog titles. Never use full names for students. Use only their first name or a pseudo name and apply this rule to their username, blog URLs, blog titles, any photos (including file names), documents, comments. Educate their family so they are aware of your policies and encourage family to leave comments such as Matt’s mum or Samantha’s nana. Use only lowercase letters and numbers, with no spaces, in usernames. While you can’t change usernames, most blog platforms do allow you to change how the name is displayed on posts and comments. Most teachers don’t allow students to use first and last name online, so most educators model this by using display names like Miss W or Mrs. Waters for their own name and display names like Misty for their student name. Most use a combination of their student’s first name followed by numbers that might represent the year, class number and/or school initials. They do this to protect the identity of the student by not including their last name and ensures their username is unique (as Edublogs has over 3 millions users). For example, username mistybp16 and blog URL mistybp16.edublogs.org. If you want the students to use the blog for their entire school life then use a combination of letters combined with a number that represents the year they started school or are finishing school. Blog domain can’t be changed once created. If you want to change it you will need to create a new blog. During the creation of a blog you have to select a blog domain for it — this is the blog URL. When you want others to visit the student blog you give them the URL link of your student blogs. The blog title is one of the first things a reader sees when visiting a blog. We recommend that you keep the Student’s first name as the first part of the blog title if you are using My Class. This makes it easier to identify a student blog from the Class Blog widget. 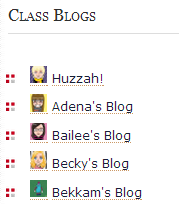 The Class blog widget is used to list all student blogs attached to My Class. 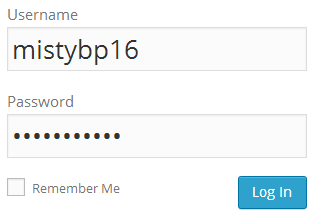 You can always change your blog title any time via Settings > General in the student blog dashboard. The best option for creating student usernames or student blogs is to use My Class. If you choose not to use My Class we strongly recommend you always add yourself as an administrator to your student blog. This means if you need to edit/delete a post, page or comment you can quickly access their blog from your blog dashboard. You don’t need to worry about adding yourself to student blogs if you are using My Class because it does this automatically for you! “My Class” is the ultimate tool for managing both class and student blogs. Quickly enable extra features on student blogs to increase their storage space, allow them to embed any code, access Premium themes and so much more.